Movie buffs and celebrity lovers will be thrilled to know that gaming software developers like Net Entertainment, Microgaming, Next Gen Gaming and iSoftBet compete with each other to produce the most innovative and feature-packed movie-based pokies on the Internet. Many movie themes pokies have been produced after online casino gaming studios secured exclusive licensing deals with some of the largest film studios, including Universal Pictures, TriStar Pictures and 20th Century Fox. As casino enthusiasts, this is brilliant for us as players, as we get to trial some of the best online and mobile film pokies, with each game trying to better the last. Many of these pokies are based entirely on the movie, while others are based loosely around certain film genres. Each of these movie-based pokies offer unique themes, symbols and bonus features. Some games offer photographic screenshots and video streams from the official movie itself, while others simply use the general idea of the movie as inspiration for its theme. We take a closer look at some of the most popular movie slots to give you an idea what to expect when playing a cinema-inspired pokies game. Net Entertainment took a bold move when it created the fantastic Aliens slot game, which is a three-tier pokie with level one maintaining traditional five reel play with a slight twist, and level two and three moving to first-person gameplay mode. During levels two and three you get to assume the position of the Marine and attempt to kill the Aliens and the Queen Hive using grenades and machine guns. The further you get, the more credits you win. 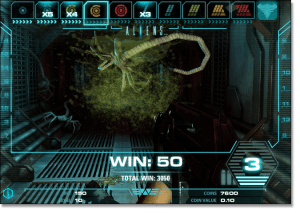 Aliens is one of the more involved and enthralling real money pokies online, and Net Entertainment took a significant step forward with its production value when it built this game. Whether you’re familiar with the original Alien movie series or not, this is a slick sci-fi themed game sure to please the dedicated video gamers out there. Microgaming’s two Dark Knight pokie games; a 243-way based slot (The Dark Knight Rises) and a progressive jackpot slot (The original Dark Knight) both include clips from Christopher Nolan’s two blockbuster movies and showcase compelling gameplay. There’s even 3D on-screen fights between Batman and Bane, which add to the suspense and help recreate the feeling of a movie experience. Just like the films on which they’re based, these pokies are on the dark and ominous side, providing a sophisticated online gaming experience with some big wins to be won. 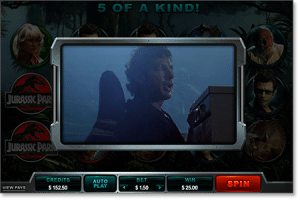 A huge shout out goes to the Jurassic Park pokies game, which was developed by Microgaming and remains one of the finest movie based slot games to date. The game uses stunning graphics, brilliant wilds, bonuses and free spin (scatter) features, and gripping clips taken directly from the Universal Pictures film itself. Playing this game will remind you of the first time you watched Sam Neill and Laura Dern run for safety from the T-Rex, long before the 2015 Jurassic World film hit our screens. Movie themed pokies including those outlines above can be found at the top rated online casinos recommended in the table above. Click any of these links to sign up for a new account and you’ll get access to some exclusive welcome bonuses available especially for our readers. For access to a majority of all the film-based slots game, we highly recommend Slots Million for Aussie players. This is an instant-play site which offers over 1200 real money pokies from all the leading software developers, including NetEnt, Microgaming, BetSoft, iSoftBet, NextGen and many more. At Slots Million you can search by game theme, making it incredibly easy to find the film inspired game you’re looking for. Are movie-based pokies any good? You don’t have to be a fan of the cinema or be able to tell Heath Ledger from Christian Bale to be able to enjoy film based slot games. These games are packed with innovative bonuses and entertaining special features to make them appeal to all players, regardless of your movie-going experience. For those who do love movies, the soundtracks and music scores within each movie-based slot title are taken from the movies themselves to give the games a true cinematic feel – get some surround sound going and you’ll feel like you’re a character in the movie. As online gaming producers continue to develop their technologies and continue to explore the wonderful world of film, we can expect to see numerous more interactive pokie titles based on the classics we’ve come to love over the decades. There’s also been several pokies based on television shows, like Game of Thrones, 24 and Beverley Hills 90210. All these pokies are legally available to play for Australian punters for real money. Sign up your details at any casino, trial the games for free first and then make a secure deposit (protected by SSL digital technology) with one of the numerous deposit options available. There are plenty of safe payment options to choose from when it comes time to withdraw your winnings. Play several of the best movie themed pokies games at Slots Million and claim a 100% matched new player welcome bonus and 100 free spins to use on selected NetEnt pokies.